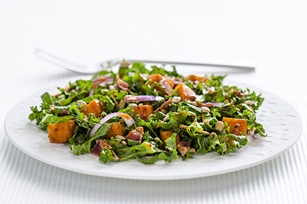 Our Sundried Tomato Sweet Potato & Kale Salad is the perfect dish for your next get together. This delicious kale salad will be a sure hit with your guests! Toss potatoes with oil; spread onto rimmed baking sheet. Bake 20 min. or until tender, stirring after 10 min. Cool 10 min. Meanwhile, combine remaining ingredients in large bowl. Add potatoes to kale mixture; mix lightly. Let stand 20 min. before serving. Substitute fresh spinach for the kale.